In this article i'm going to explain about comment hierarchical comment section database designs as i shown in above images. So first we need to create database table's UserTable, ParentCommentTable and ChildCommentTable. This table i'm creating with default data for the purpose of avoiding to insert user data through web pages. By using this table i'm going to create Login page and verifying user credentials, if user exists then he allow to enter Comments otherwise not. If user post comments directly through comment section in your Websites (i.e Social Networking Sites, Forum Site, Blogs, Youtube.....) is called parent comments. CommentID is autogenerateid in sql which generate commentid no once data is inserted along with ussername to the ParentCommentTable. Once you click on publish button whatever comment you enter is called Parent Comment. 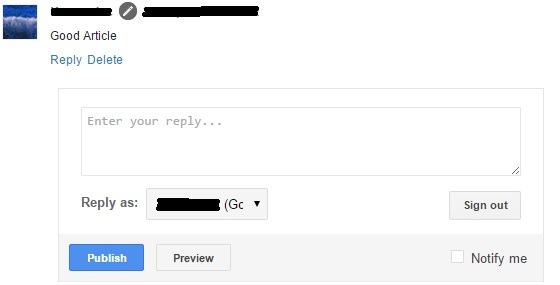 If user Reply the existing comment in any site is called Child Comment. Here existing comment is nothing but a Parent Comment and we store reply comment to child comment table along with parentcommentID. for more info we see in programmatically. 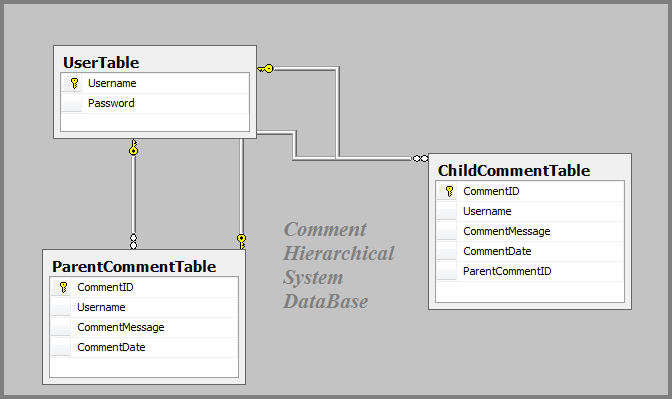 0 Komentar untuk "Comment Hierarchy Comments Section DataBase in SQL Server"